The legendary Jungle Room sessions from 1976 have delivered some fine fan favorites like "Moody Blue" "Way Down" & "She Thinks I Still Care". Unfortunately these turned out to be Elvis' last recording sessions. The untimely death of a music legend was news that shocked the world but delivered the pressing plants some overwork. The Demand for Elvis records was suddenly huge. Moody Blue was re-released on Blue Vinyl and several reprints followed later and reached up to today 2x platinum. 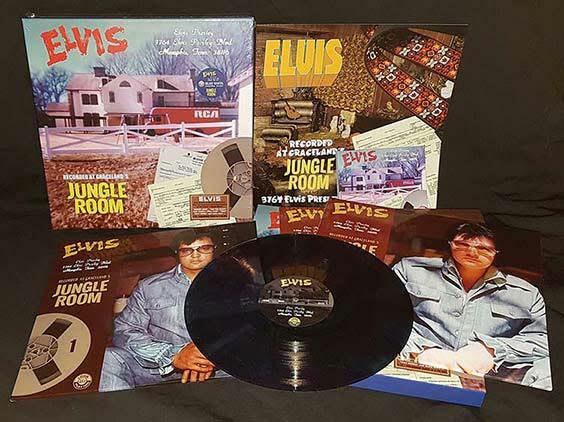 After the success of the earlier released 2 cd set "3764 ELVIS PRESLEY BLVD" the demand for a vinyl version was big. Now to celebrate the 40th anniversary of these recording sessions from 1976 this beautiful vinyl box is released. The set contains 3 high quality vinyl lp's along with a 2 cd set & A FULL COLOUR LP SIZE BOOKLET! The vinyl is available in two colors: RED & (moody) BLUE. Both sets are very limited to only 200 copies of each color. Also the two cd set is available again in a digi-sleeve. THIS DELUXE(!!) SET IS VERY LIMITED AND IS AVAILABLE NOW!